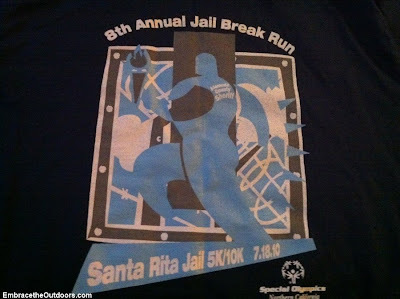 We ran the 10k Jail Break Run at the Santa Rita Jail in Dublin today. They also had a 5k race. The location of the race got us interested initially and because it benefitted the Special Olympics we decided to participate. There was ample parking at the jail so we had no delay finding a spot. It was a short walk to race bib pick-up which was on the running track. After signing the required waiver, bib and t-shirt pick up went smoothly. The start line was not so obvious but announcements were made in plenty of time to let us know where to go. 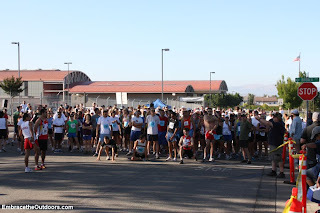 It was a mass start with the 5k and 10k groups starting at the same time and surprisingly was not as chaotic as it sounds. Although it was delayed about five minutes or so since there were a lot of people doing same day registration. 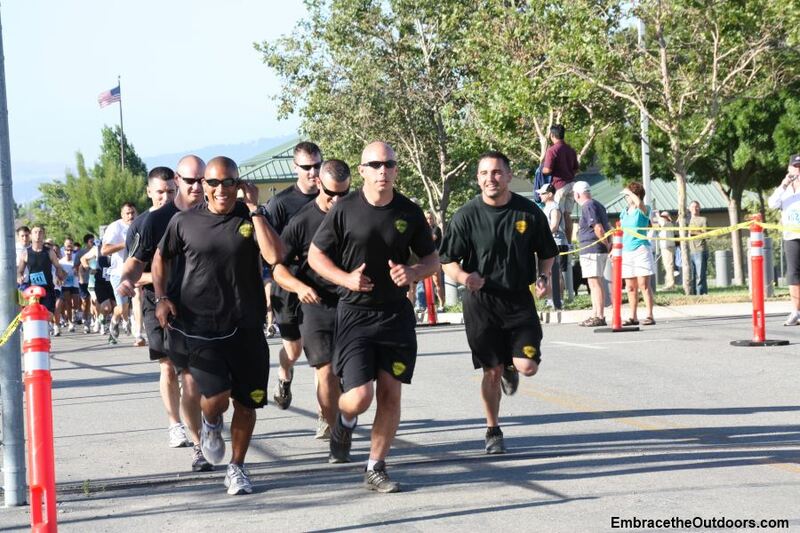 The SWAT team lead the start, running in formation. The route started by making a loop around the jail. Just as we got back to the start area there was a split between the 5k and 10k race routes. It was obvious that there was a split but not obvious as to who goes in which direction. We nearly missed our turn and we know one person who went the wrong way. The route for the 10k went north, next to the jail, before going up a hill. 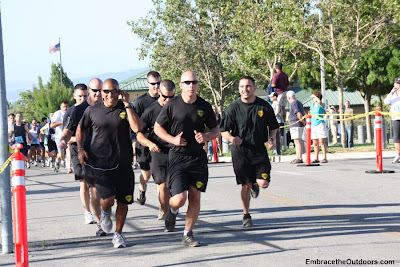 This is the same hill that the SWAT team has to run in their training. It wasn't too steep but it was an impressive hill that climbed over a mile to the water tower. The trail on the hill was completely exposed so the sun beating down was tough. Once at the top we made our way around the water tower before heading back down the hill. Passing through the start again the route takes you by the training center before joining Tassajara Creek Trail. We followed this trail for about a mile or so before returning on the street through a residential area. The course in this area had some slight uphills and downhills with few flat sections. Heading back toward the start was the finish line, with the 10k chute to the left and the 5k chute to the right. 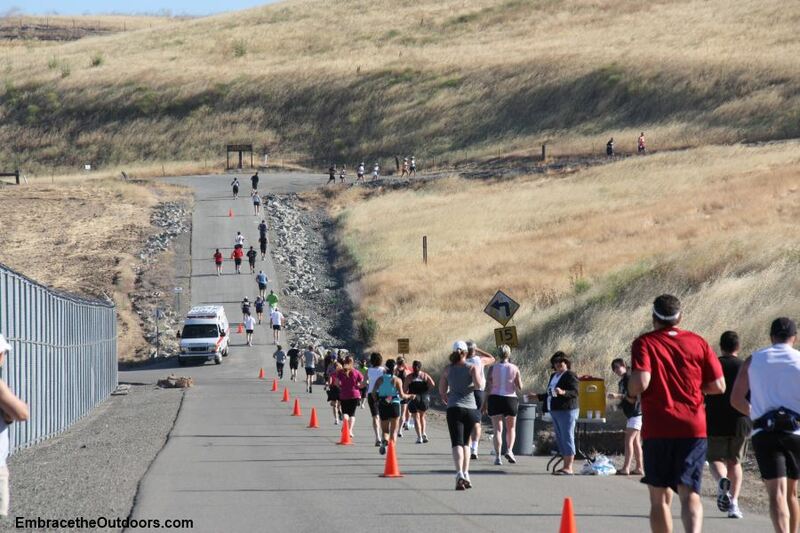 There were several water stations along the course and mile markers at every mile. There were chalked arrows along most of the route to help guide the runners on the right path. Plenty of bananas, orange slices and water were on the running track postrace. The kids races followed, then the raffle for Giants tickets then race awards. We left just as it was really warming up. It was a good race course with good support but the split of the two races could have been better.